Transformation phrase: Dhampir Power, Make Up! Attack phrase: Dhampir Order: Red Rose Vertigo! Laura is the daughter of the future ruler of Crystal London, Countess Integrity. 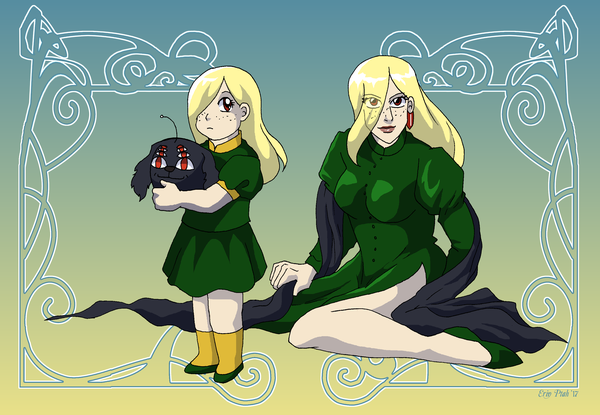 A dhampir, she only grew to the physical age of ten before she stopped growing. When a mysterious enemy attacks the city, the time-bending Sailor Ghost sends her to the past, where she searches for the Staff of the Master of Monster, which she believes has the power to save her family. She is briefly kidnapped by the enemies and artificially aged into an evil form known as Highland Lady. Given her Hellsing blood, she is technically able to control Alucard, which leads to a battle of wills between her and Integra. After the enemy is defeated, Laura returns to her normal body, is reunited with her family, and begins to grow again. 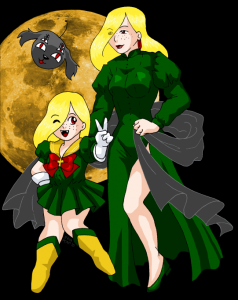 However, now that she has awakened as Sailor Dhampir, her parents decide to send her back into the past to train with the Sailor Knights of old….